Gaspard de Coligny, lord of Châtillon, was a loyal servant of the crown. He was converted to the reformed faith and became the leader of the Protestant party. He was assassinated during the massacre of Saint Bartholomew. Although brought up a Catholic, Gaspard de Coligny was converted to the reformed faith during his Spanish captivity (1557-1558) after the battle of St. Quentin. It was during this captivity that he read and studied the Bible. Much in favour at the court of Henri II, he was named Admiral of France by him in 1552. In 1560 he made a request to the king, asking for churches to be built for the Protestants and to put an end to the penalties inflicted on them. With Catherine de Medici he prepared the Colloquy of Poissy (1561). He played an important role during the first wars of religion and after the death of the prince of Condé in Jarnac, he became the undisputed leader of the Protestants. After the treaty of St. Germain (1570), which brought the third war of religion to an end, Coligny was summoned to the royal court, where he enjoyed the king’s favour. 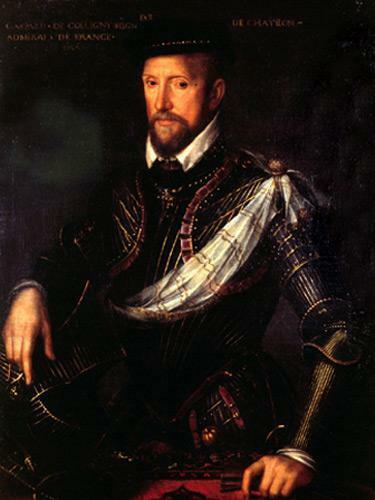 He encouraged Charles IX to support the rebels in the Low Countries who were struggling against King Philip II of Spain. Catherine de Medici, however, was most hostile to this idea and the Catholic faction, headed by the de Guise family, was likewise exasperated by it. 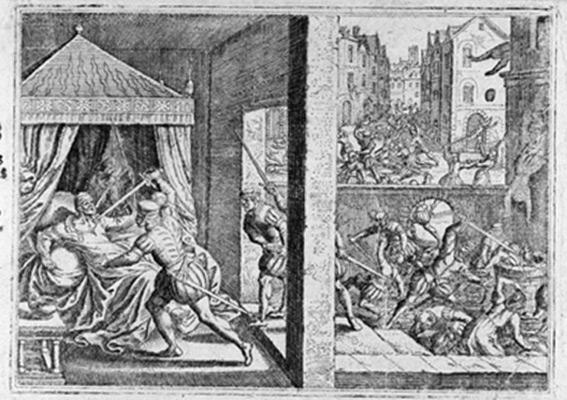 Assassination of Coligny (1572) © S.H.P.F. On 22nd August 1572, an attempt was made upon the life of Coligny. The instigator of the crime may have been Catherine de Medici ; but it most probably was the Guise family ; Spain may likewise have been involved in the plot. This failed attempt provoked violent reactions on both sides. The situation became tense ; tempers rose and finally set off the massacre of St. Bartholomew on 24th August 1572, which began by the murder of admiral de Coligny. The admiral’s body was thrown out of the window of his house. Coligny’s murder as related by Agrippa d’Aubigné in his « Histoire Universelle »: Besme entered the bedroom where he saw the Admiral dressed in his nightgown. He asked, « Are you the Admiral ? » The reply was « Young man, take thought for my advanced age ». Besme thrust his sword through the Admiral’s body then withdrew it and slashed his face in two. When the duke of Guise asked if the mission had been accomplished and Besme said it had, the latter was told to throw the body out of the window, which is what he did.